Willow Creek Community Church has expanded its Clear-Com system at its main campus in South Barrington, IL to allow for enhanced communications between its digital and analog intercom systems, and enhanced wireless intercom communications between its staff and satellite contractor. Founded in 1975 by Bill Hybels, Willow Creek began holding services in a movie theater. 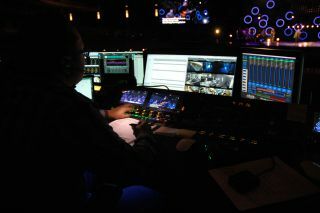 Today it serves more than 20,000 worshippers each weekend from six regional campuses around the Chicagoland area. The main church campus at South Barrington was built in 1980 (Lakeside Auditorium), while the South Barrington Activity Center began operation in 1990 and the Main Auditorium was opened in 2004. An additional six regional campuses in Illinois (Chicago, Crystal Lake, Huntley, North Shore, South Lake, and Wheaton) are also equipped with Clear-Com intercom systems. From the start, video, audio, and a reliable communication system have played a key part in the services. Willow Creek Community Church added a new Eclipse HX Omega matrix with six LQ Series interfaces that can connect two- and four-wire audio and call signaling over IP networks; three IVC-32-HX interface cards for expanded communications over LAN, WAN, and the internet; 14 FreeSpeak II wireless beltpacks and a host of transceiver antennas; five Agent-IC licenses to allow smartphones and tablets to operate as fully featured mobile user panels over Wi-Fi, 3G, 4G, and LTE networks; an E-Dante64-HX interface card to transport up to 64 channels of high-quality audio to multiple Dante-enabled devices using standard Ethernet network infrastructure; V-Series user key-panels; and other accessories. The benefits of the new system were immediately apparent. The hum associated with the old copper-based analog system was eliminated with the LQ Series’ ability to maintain partyline tie-ins via IP. Running Cat-6 for the LQ Series was a cleaner and less expensive solution, and allowed Willow Creek Community Church to leave the copper in place, as it wasn’t cost effective to pull out.